In line with the trend to make routers more versatile comes the Bosch 1617EVSPK. With this router, Bosch intended to start a new trend, but did it manage to do that; you will find that in our review. On paper, this router looks feature packed. You get two bases, fixed and plunge, a powerful motor and few features with the promise of increased efficiency and performance. On the outside, you get a solid aluminium router, the handles (of both fixed and plunge base) are well-built and good to hold, and the various knobs makes sure that you can make a lot of adjustments with to router. With manufacturers trying to move from single purpose routers to more versatile routers, the Bosch 1617EVSPK seems to have all the firepower needed to lead the pack. Before we get to the top features, here is what the specs sheet looks like. This router has a 2.25 Horse power motor with a current rating of 12 ampere. You get 8,000 – 25,000 rpm with the variable speed controller and the diameter is 6 inches for fixed base and 6-11/16 inches for plunge. The whole body is made of aluminium which ensures that this router is comparatively lightweight (below 20 pounds). It features a durable construction, however the wooden handles on the fixed base could have been a little better. This router is meant to handles heavy woodwork and the construction & design back that up nicely. The 2.25 HP motor is designed to handle heavy jobs. The high power rating ensure that you can handle almost anything with this, and that with the added convenience of two different bases. The powerful motors like in the Dewalt DW618PK can sometimes destroy the wood. Fortunatley, This is not the case with 1617EVSPK which has a soft start mechanism which prevents any damage at the start. The constant response circuitry ensures that the router maintains the optimal efficiency and speed throughout resulting in cleaner cuts. You can easily change the speed with dial located on the front side of the router. You get 6 different speed options and rpm ranges from 8,000 to 25,000. For the first three levels you get RPM below 17,000. The lower speed settings can be paired up with larger diameter bits while the higher speeds can be used to handle smaller bits on softwood. The constant response circuitry ensures you get the desired cuts at the desired speed. A slightly less powerful router with variable speed is the Bosch PR20EVSK, which however only comes with a fixed base. Finally you get both fixed base and plunge base with this router kit. The base diameter is large enough and should work with most jobs. 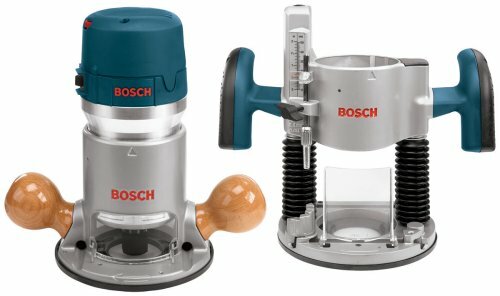 The patented Bosch Precision Centring Design allows the bit to be in line with the sub base. You can also make depth adjustments on the fixed base with the help of a knob. This works well for under the table applications. There are a few issues to with the 1617EVSPK. Firstly it quite cumbersome to change the bases. With practice and continuous use this might seem easier but you will still face some difficulty. Once it’s locked however, it stays secure. There also few issues with the switch which attracts dust which can result in a malfunction. You are advised to keep the area clean and wipe the router for dust after every job. It is recommended for anyone except complete beginners. If you are planning to work on a huge variety of workpieces and designs then you can buy this and get both plunge and fixed routers. If you have the budget for it, we’d recommend you to get the Bosch Ra1181 router table as it’s a perfect match for this rotuer. If you handle heavy work, the powerful motor with speed control works well. Solid construction and durability make this wood router a winner.